We stayed at our first "Casa de Ciclistas" (House of Cyclists) in Cali, and it was an incredible experience. 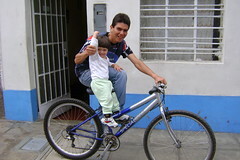 Casas de Ciclistas are a special Latin American institution, probably started by a gentleman in Trujillo, Peru named Lucho. He opened his home to travelers on bicycle years ago and has now hosted hundreds. He has a very humble home, but always makes it available for cyclists, and is one of the best known resources for touring cyclists in Latin America. Well, other people think it´s a good idea too, and our new friend Miller Hernan in Cali. 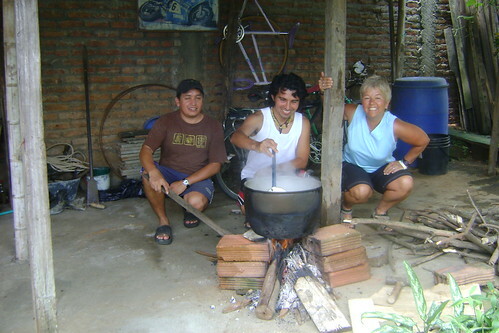 Miller is interested in touring, and decided to follow Lucho´s example, and what a delightful Casa de Ciclistas he has created. Hernan's family has a very simple house in a calm "tranquilo" neighborhood in southern Cali, and they just invited us in. We put up our tent in their very nice patio and were more comfortable than we've been in 90% of the hotels we've ever stayed in.